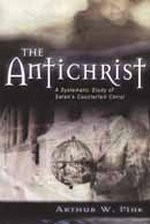 Description: The Antichrist: A Systematic Study of Satan's Counterfeit Christ. Features an exhaustive, scholarly treatment of the biblical names and titles of the Antichrist. An important contribution to the study of eschatology. In a comprehensive study of Satan's false messiah, the author arranges biblical teaching on the Antichrist around his origin and identity, the time of his appearance, his work and doom, as well as tracing all references to him in the Psalms, the Prophets, the Gospels, the Epistles, and Revelation. This vivid biography of the Lawless One, the full embodiment of human wickedness, is a valuable resource for all students of the Scriptures. Dimensions: 5.25" x 8" x 5/8"